The United States Code (USC) brings together (codifies) by subject or area all the current federal laws. Laws are then further arranged by title (volume) and part or section number. The laws pertaining to copyright are found at 35 U.S.C. An easy-to use and search version of title 35 of the U.S. Code is available from the Legal Information Institute at Cornell University. A downloadable version of title 35 of the U.S. Code from the U.S. House of Representatives, Office of the Law Revision Counsel is is also available. Another verson of title 35 of the U.S. Code is also available at the legal site Findlaw. Please note: The codified version of the U.S. Code available at these public sites is only effective as of a certain date. Newer laws may not yet be incorporated into the Code. Always check to see the effective date of the title of the Code you are using. (a) The term "invention" means invention or discovery. States of America, its territories and possessions. under section 311 who is not the patent owner. Sec. 1000(a)(9) [title IV, Sec. 4603], Nov. 29, 1999, 113 Stat. title. 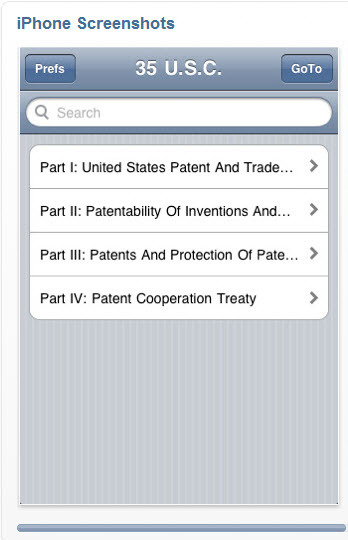 The present statutes use the phrase "invention or discovery"
Paragraph (b) is noted under section 101.
expressions in various parts of the revised title. 1999 - Subsec. (e). Pub. L. 106-113 added subsec. (e). under section 41 of this title. SAMPLE SECTION OF THE U.S. CODE: TITLE 35 USC 100.